Father Joe – who is visiting to Australia next year – uses yoga to rehabilitate people with alcohol addiction problems through the Kripa Foundation, an organisation he started 34 years ago. 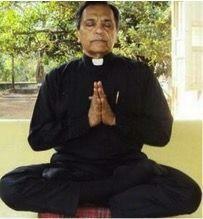 “Jesus, for me, is the supreme yogi, because he spoke about being one with God,” Pereira told Matters India. The author of a new book, Yoga for the Practice of Christian Meditation, Pereira says Iyengar yoga transcends all ideologies and philosophies.